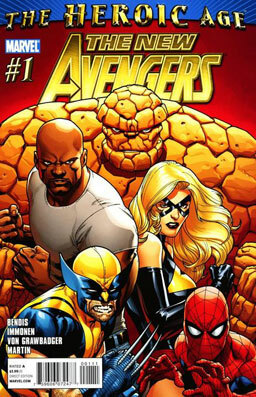 It’s yet another “Avengers” title from Marvel. Steve Rogers and Tony Stark want Luke Cage to lead a new Avengers team, but Luke is hesitant. To sweeten the deal, Tony sells him Avengers Mansion for a dollar. Man, real estate values are just crashing like crazy. So while Luke picks out his team, Dr. Strange is in some trouble. He was called out to help Daimon Hellstrom with some problem, but it turned out that the Son of Satan was possessed by… something. And whatever it was possessed Strange, too, then they both went after Dr. Voodoo, the new Sorcerer Supreme, so they can steal the Eye of Agamotto. Back at Avengers Mansion, Luke has selected his team — Iron Fist, Spider-Man, Wolverine, Hawkeye, Mockingbird, Jewel, Ms. Marvel, and Ben Grimm, the ever-lovin’, blue-eyed Thing. But when the Eye of Agamotto magically appears in Luke’s hands, and the possessed Strange and Hellstrom teleport in, is the new team going to be finished before it even begins? Verdict: Thumbs up. So far, it’s just an introductory issue, making sure we know who the players are, but it’s got some good moments, particularly the purchase of Avengers Mansion and Ben Grimm’s induction onto the team. 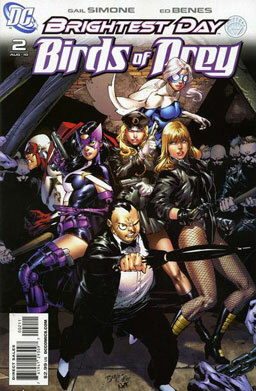 Black Canary and the Huntress are facing off against an extremely skilled martial artist called the White Canary. Lady Shiva formerly used that name, but this doesn’t seem to be her — it’s someone else entirely. And White Canary is very, very good. She pwns Dinah and Helena without very much effort, and even the intervention of Hawk, Dove, and Lady Blackhawk doesn’t do much to even the odds. And it gets worse when the White Canary — or someone associated with her — releases information to the press making Black Canary look like a murderer. A bunch of crooked Gotham cops appear on the scene. The Penguin, injured previously by the White Canary, tells them to take him to his club, where they’ll all be safe, so the team fights its way through the cops — and then finds out that Black Canary’s real name has been released to the media, along with embarrassing information about her past — and two old associates of the Birds of Prey have been killed. How much worse are things going to get? Verdict: Thumbs up. A very intense storyline, so far, with a villain — or maybe a group of villains — whose physical attacks are devastating — and whose non-physical attacks are even worse. Excellent writing by Gail Simone — and while I can’t normally stand the art of Ed Benes, I’ve gotta say, the art here seems to be pretty good. So hey, go pick it up. Remember our Friday Night Fights entry from a week or so ago featuring Winsor McCay’s surreal turn-of-the-last-century strip “Dream of the Rarebit Fiend”? Here are about a hundred of those strips for you to enjoy.